Congratulations to all our Lean Six Sigma Students who received their QQI results this month. We are very proud of their achievements and cost savings back to their companies Particular thanks to our tutors John, Éamon and Ashling for their support and mentoring to the students. 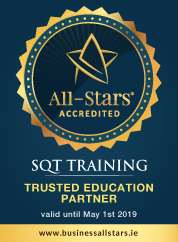 Over 3,000,000 savings were made from assessments submitted and to date projects completed by SQT students have made a combined saving of over 100 million for their companies. Why SQT for Lean Six Sigma? Lean reduces waste by streamlining a process and eliminating Non Value Add. Six Sigma delivers breakthrough process improvements by eliminating defects and effectively solving tough problems. Combining these two methods gives you a comprehensive tool set that accelerates the speed and effectiveness of any process within an organisation – delivering improved quality, capacity, predictability and reduced overall cost. Lean Six Sigma is a proven enabler for delivering business success in any type or size of organisation. It has been used by Global and Fortune 1000 companies as the tactical means for achieving key strategic goals. Our Lean Six Sigma training is delivered using the DMAIC methodology. We believe, in this field, the best people to learn from are seasoned industry experts, not just academics. That’s why our Programme Leaders, John Ryan and Éamon Ó Béarra and Course tutors are renowned Lean Six Sigma practitioners. Experts who have worked at the coalface, who can draw on their experiences and share real world insights, stories and techniques. Tutors to empower and inspire you. Their experience spans a wide range of industries including Healthcare, Financial Services, Food & Beverage, Logistics, Manufacturing, Software, Telecommunications and Utilities.